For the village located within this town, see Chateaugay (village), New York. For other uses, see Chateaugay (disambiguation). 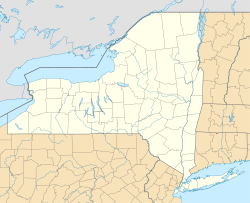 Chateaugay /ˈʃætəɡeɪ/ is a town in Franklin County, New York, United States. As of the 2010 census, the town population was 2,155. The name is derived from a location in France, which was applied to a local land grant. Within the town is a village also named Chateaugay. The town is in the northeast corner of the county. The first settlement took place in 1796. 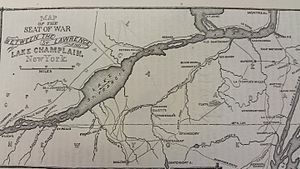 The town was formed in 1799 before Franklin County was established, from parts of the towns of Champlain and Plattsburgh. By 1802, Chateaugay comprised most of Franklin County. Subsequently, its territory was reduced to form other towns. 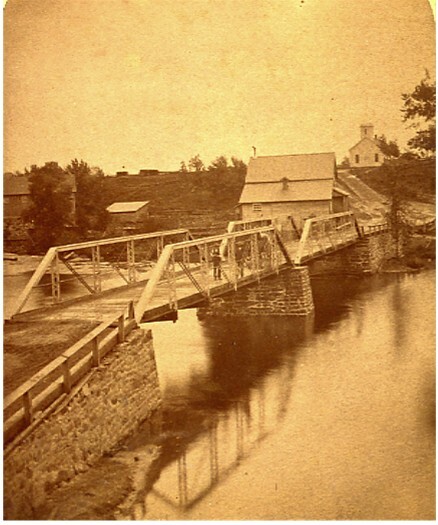 The town of Malone was set off from Chateaugay in 1805. When Franklin County was established from Clinton County, part of Chateaugay remained in Clinton County. The town of St. Armand was taken off in 1822 and placed in Essex County. The remaining three towns derived from Chateaugay remained in Franklin County: Bellmont (1833) and Franklin (taken from Bellmont in 1834), and Burke (1844). Chateaugay was the hometown of Orville H. Gibson, who founded the Gibson Guitar Corporation in 1902. He died on August 21, 1918, in St. Lawrence State Hospital, a psychiatric center in Ogdensburg, New York. In 1856, a tornado demolished more than one hundred structures in the town. In 1868, the community of Chateaugay in the center of the town incorporated as a village. Since 1934, the McCadam Cheese Cooperative (founded in 1876) has made cheddar cheese in Chateaugay. The Chateaugay–Herdman Border Crossing was listed on the National Register of Historic Places in 2014 as the U.S Inspection Station–Chateaugay, New York. According to the United States Census Bureau, the town has a total area of 49.8 square miles (129.0 km2), of which 0.01 square miles (0.03 km2), or 0.02%, is water. The northern town line is the international border with Canada (Quebec), and the east town line is the border of Clinton County. U.S. Route 11 is an east-west highway crossing the central part of the town. New York State Route 374 is a north-south highway intersecting US-11 at Chateaugay village. The Chateaugay River, a tributary of the Saint Lawrence River, flows northward through the town from Lower Chateaugay Lake. As of the census of 2000, there are 2,036 people, 714 households, and 477 families residing in the town. The population density is 40.9 people per square mile (15.8/km²). There are 865 housing units at an average density of 17.4 per square mile (6.7/km²). The racial makeup of the town is 89.69% White, 6.39% Black or African American, 0.34% Native American, 0.10% Asian, 2.95% from other races, and 0.54% from two or more races. 6.19% of the population are Hispanic or Latino of any race. There are 714 households out of which 30.7% have children under the age of 18 living with them, 52.1% are married couples living together, 9.7% have a female householder with no husband present, and 33.1% are non-families. 27.2% of all households are made up of individuals and 11.5% have someone living alone who is 65 years of age or older. The average household size is 2.46 and the average family size is 2.97. In the town, the population is spread out with 22.9% under the age of 18, 8.5% from 18 to 24, 35.8% from 25 to 44, 20.7% from 45 to 64, and 12.1% who are 65 years of age or older. The median age is 36 years. For every 100 females, there are 126.7 males. For every 100 females age 18 and over, there are 134.0 males. The median income for a household in the town is $32,609, and the median income for a family is $37,639. Males have a median income of $29,716 versus $21,125 for females. The per capita income for the town is $15,541. 17.5% of the population and 12.3% of families are below the poverty line. Out of the total population, 23.1% of those under the age of 18 and 14.5% of those 65 and older are living below the poverty line. Brayton Hollow – A hamlet northwest of Chateaugay village by the west town line on County Road 35. Chateaugay – The Village of Chateaugay is centrally located within the town on US-11 at NY-374. Chateauguay Chasm – A location at the west town line. Chateauguay River – A tributary of the Saint Lawrence River. Chateauguay State Fish Hatchery – A fish hatchery near the east town line. Earlville – A hamlet near the east town line on County Road 39. 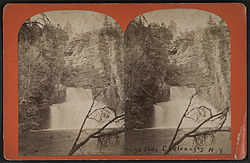 High Falls Park – A park southwest of Chateaugay village. ^ a b c "Geographic Identifiers: 2010 Census Summary File 1 (G001), Chateaugay town, Franklin County, New York". American FactFinder. U.S. Census Bureau. Retrieved June 10, 2016. ^ Lossing, Benson (1868). The Pictorial Field-Book of the War of 1812. Harper & Brothers, Publishers. p. 881. ^ "National Register of Historic Places listings for September 19, 2014". U.S. National Park Service. September 19, 2014. Retrieved September 20, 2014.